An interactive artwork about Home, place memories, nostalgia, and (re)connection. 6000 saga seeds, white pigment ink, text on glass mirror. 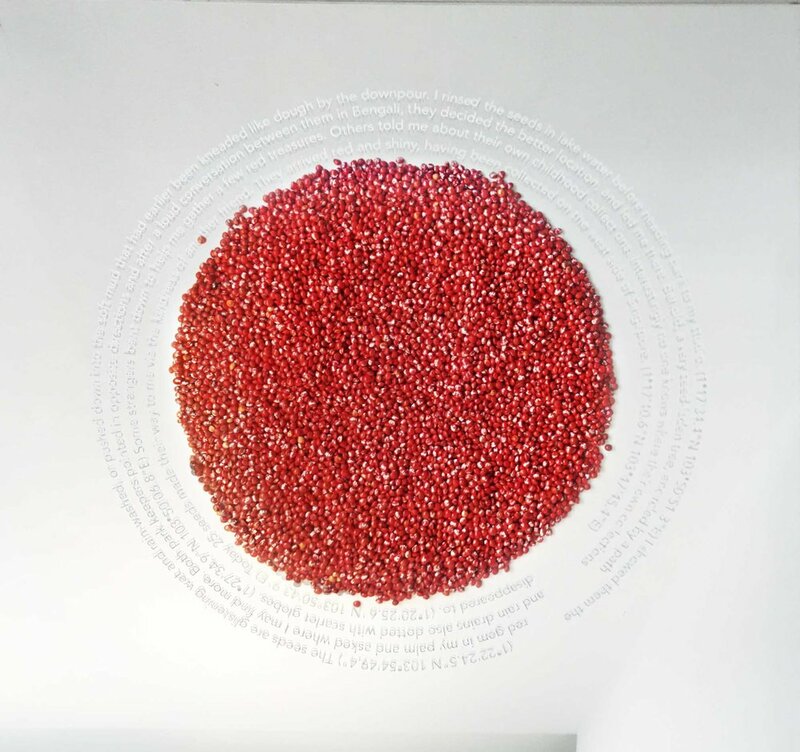 This artwork is made of 6000 naturally red ‘saga seeds’ collected during the artist's walking journeys through Singapore, Indonesia and Malaysia. Saga seeds are redolent objects found in these countries symbolising love, nostalgia, childhood, and used in many children’s games. The audience is invited to pick up a seed. Upon each seed is a unique handwritten number referencing the story behind each one, can only be read if a viewer references the seed number in the online seed archive. 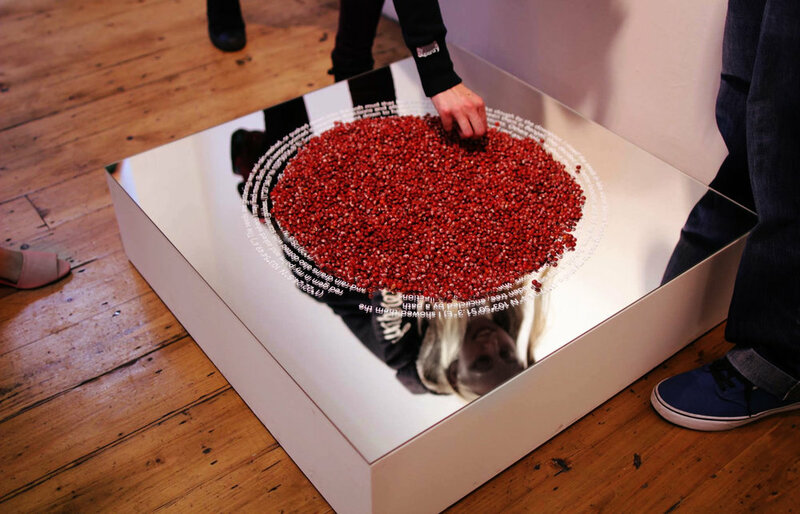 This artwork is based in the UK, and follows on from previous works including Pass It On (2013), which consisted of a river of 8000 seeds in Singapore. There is a large body of place memories and recorded moments which form the research and thought process behind these works. The groundwork seeks to create a connection through shared memories, from one space to the next, from one person to the next, from artist to audience. The research led to investigations into the processes occurring in anamnesis, including reverence and conservation, nostalgia, forgetting, saudade, longing, disremembering, erasure, recollection and rewriting. In the artwork this is played out through five acts: The journey of the artist to find the seeds, artist numbering each seed by hand, the placing of seeds to cover a text underneath, the gradual eroding of the seed layer as the audience picks up seeds and reveals the text, and finally delving into deeper place memories for those who look up the story of their seed online. Read the stories behind each seed's journey here. If you were one of the visitors who picked up a saga seed from the artwork, read your own seed’s story by entering its number in the box here. Six Thousand Moments was commissioned for and first exhibited in EXPARTE, an exhibition curated by curator collective Something Human in London, 2015. EXPARTE was a part of Singapore Inside Out and SG50.